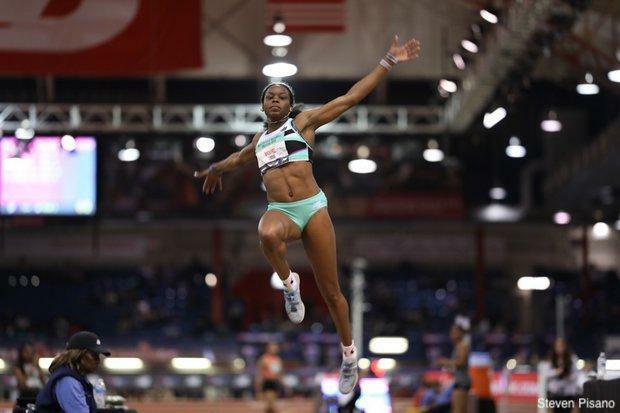 All eyes are on Jasmine Moore (TX) heading into Sunday's triple jump. The defending champion in the event, many people are watching to see if she can best the senior and national record of 44-6.75. But before that show, she decided to put on a clinic in the long jump on Saturday. Moore took home the national championship with a 20-9 clearance, the first jump over 20 feet in 2019. The leap was an indoor personal best for the senior from Mansfield Lake Ridge High School and only a few inches off her lifetime best of 21-0.25. The Georgia commit will be back to defend her triple jump crown tomorrow and look to sweep the horizontal jumps.